Cuts to the state budget and Permanent Fund dividend dominated a debate Monday between Republican Senate President Sen. Pete Kelly and Democratic Rep. Scott Kawasaki, running for state senate in District A. The incumbent and challenger also clashed over state Medicaid and climate change in their last debate before voters next Tuesday decide the outcome of the Interior’s most heated legislative races. 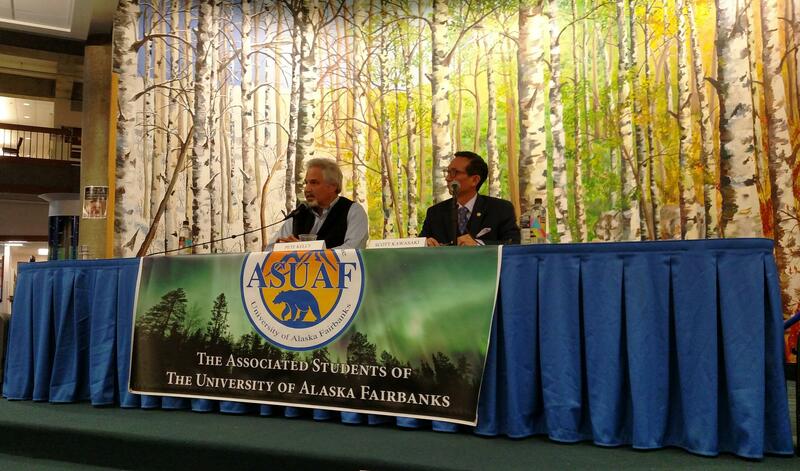 Pete Kelly told about 40 people at the forum on the University of Alaska Fairbanks campus that he supported cutting the university system’s operating budget by 10 percent in 2015 because state revenues had dropped sharply due to the plummeting price of oil. Kelly says he was able to help UAF by convincing lawmakers to go along with appropriating $245 million to build a new coal-fired power plant for the campus. But he returned several times to his refrain about falling oil prices forcing budget cuts in response to Kawasaki’s criticism of the senator’s refusal to consider any alternative that included raising revenues. Kawasaki says the plan included a combination of budget cuts and taxes proposed by Gov. Bill Walker and supported by the bipartisan House leadership. He says the cuts demanded by Kelly and other Republicans cuts deepened the recession that has left Alaska with the nation’s poorest-performing economy. Kawasaki likened his support for additional revenue sources to Kelly’s comment about making tough decisions to continue cutting the budget. “Sometimes, it will take a legislator that says ‘Y’know what? We do need more money for this particular thing,’” he said. But Kelly attacked Kawasaki for supporting Walker’s reduction of Alaskans’ PFDs to $1,600, which the governor proposed after Senate Republicans refused to go along with the other proposed revenue sources. And Kelly says hiking taxes while the economy was tanking would’ve only aggravated the job losses. “When you have 12,000 people being laid off, what you don’t want to do is start putting an income tax on people who have a job. So we fought against the income tax,” he said. Kelly says revenues have picked up in recent weeks as oil prices have risen. And he says some university funding has been restored. On another issue, Kelly said in response to a student-moderator’s question that the state’s Medicaid system is broken. He says reforms included in a measure he introduced and helped pass in 2015 fixes some of the problems and has saved the state some $400 million. “The crux of my bill was eligibility verification; making sure people didn’t use ‘boutique drugs,’ when they could take generic drugs; travel restrictions, emergency room restrictions,” he said. Kelly didn’t respond to a question about whether he supports Medicaid expansion in Alaska. In answer to a question on how the state should respond to climate change, Kelly says the state should try to help people in littoral communities where erosion is chewing away the coastline. But he cautioned against involving the state too deeply in the issue. “What I’m nervous about when I hear about climate change is that we will adopt kind of the larger political agenda that is extremely expensive and is very difficult to navigate through the United Nations treaties and some of the regulations that come out places like the EPA, et cetera,” Kelly said. Kawasaki pounced on that response, accusing Kelly of denying climate change, which he says affects all Alaskans. And he says it’s an issue UAF researchers have been studying for decades. “Alaskans and this university can be front and center in research to try and figure out how we mitigate the problems,” he said. Kawasaki says despite dire warnings and predictions, such as one issued earlier this month by the UN’s Intergovernment Panel on Climate Change, he’s hopeful that an immediate and concerted response could slow or reverse global warming.